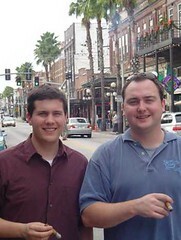 Yesterday your three hardworking Stogie Guys took some time to relax and have some cigars in Ybor City. By chance Patrick A and myself were in the area for business, and once we realized we’d have some free time, we immediately contacted Tampa Bureau Chief George Edmonson to meet for a few hours in the cigar capital of America. With just over three hours to spend in the historic district of Tampa, we wasted no time. We started our trip by meeting in front of the Columbia restaurant, where they roll their own cigars in the Gonzalez & Martinez Cigar Factory. The factory itself was closed when we were there and, unfortunately due to Florida’s Draconian restaurant smoking ban (how a state with well over half a million Cubans bans the traditional after dinner cigar is beyond me), we couldn’t light up at the restaurant. So we walked down E. 7th Avenue (the main drag in Ybor) until we came across an open cigar shop (at 11 on Sunday morning your options are a bit limited). Outside of The Tampa Cigar Company Inc., the owner was puffing away at a cigar. As we walked in, to our left was a cigar rolling station surrounded by dozens of cigar presses, and to our right was a walk-in humidor with hundreds of stacked, un-banded cigars which we were told were all rolled right there in the shop. At the owner’s recommendation we selected three robustos ($5 per stick), which we enjoyed with strong cuban coffee. After a leisurely smoke we thanked our host and left to have some lunch. Later we found ourselves at King Corona Cigar, a large combination cigar shop, bar, and barbershop. They carry a respectable selection of name-brand cigars in a massive humidor. Tucked in between the CAO’s, Fuentes, and Diamond Crowns was an unbanded cigar simply called “Ybor City Handmades” that came in three sizes – Lonsdale, Torpedo, and Churchill. Unfortunately, like every cigar, this stogie adventure had to come to an end, but not before everyone walked away with a few more cigars for our humidors and a few pleasant memories. After my visit, I can honestly say that Ybor is an absolute must for American cigar enthusiasts. Walking down 7th avenue is like witnessing stogie history firsthand. It was also great to finally meet George Edmonson and share a few smokes and laughs with him. I loved Ybor too. It's a completely different culture down there. You don't feel like an outcast while smoking cigars. How are the prices there on national brands? I got the chance to visit Tampa the weekend of Guavaween for a family reunion. The history of the city just fascinates me. You can still dive around areas of town and see the old tobacco warehouses and factories. 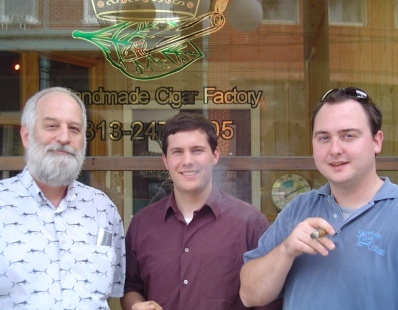 I would like to go back for a tobacco/cigar tour one of these days. How did the local cigars compare to some of the national/well known brands? I actually thought a few of the local blends tasted better and were better constructed than most premium national brands. And they're much cheaper, too. If you get down to Ybor, there's no reason to smoke Macanudos or Montecristos (even though those are great smokes). Fortunately, some of the local shops, like King Corona, sell their house brands over the internet. It's worth checking out.